Make way for Glazed Ham with Dijon-Pineapple Sauce. 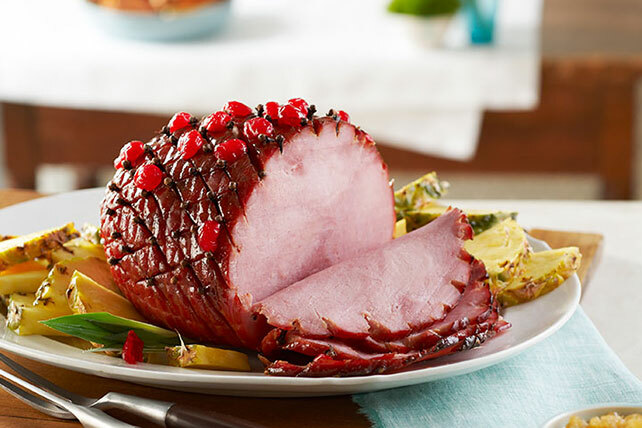 Glazed ham is the ultimate holiday recipe for any occasion, and this sweet and spicy glazed ham is a crowd-pleaser. Mix sugar, syrup and mustard until blended. Use paring knife to make shallow even diagonal cuts across top of ham in one direction. Repeat, making slits in opposite direction to form diamond shapes. Insert cloves where cuts meet. Place ham on rack in shallow pan. Place cherries, cut-sides down, on surface of ham. Bake 2 hours or until ham is heated through, brushing occasionally with 1/2 cup syrup mixture after 1-1/2 hours. About 10 min. before ham is done, mix remaining syrup mixture with cornstarch and pineapple in saucepan; bring to boil on medium-high heat, stirring constantly. Cook and stir on medium-low heat 5 min. or until thickened. Slice ham. Serve with sauce. If ham begins to brown too quickly, cover loosely with foil.